How a homemade Great Depression Christmas gift turned into an iconic Canadian game. We look at concepts and products that, for better and worse, were developed in Toronto. 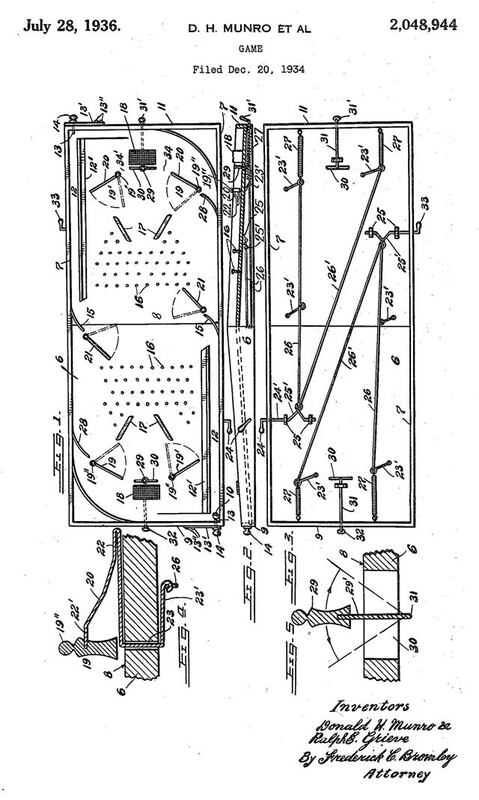 Diagram of the original table hockey game, from Donald Munro's American patent, issued 1936. Image from Google Patents. Like many people during the Great Depression, Toronto resident Donald Munro was unable to lavish his children with Christmas gifts. Not wanting to go without giving them something during the 1932 holiday season, he took various items from around his home—clothes pins, wire hangers, clock springs, and lumber—and patched together a toy. The result, as described in the introduction of the American patent he received four years later, was “a novel and amusing parlour game simulative of hockey, and calling for the exercise of skill and judgement on the part of the players in order to score against each other.” He had, of course, invented table hockey. Noticing the enjoyment shared by everyone who played the game, Munro pondered its commercial possibilities. He convinced Eaton’s to take several games on consignment. Almost immediately, the retailer asked for more. Munro soon established a toy company to manufacture his game, so he could supply major retailers like Eaton’s and Simpson’s. Many sales came through department store catalogues, where, by the start of the ’40s, a game could be ordered for five dollars. Early versions of Munro’s game were like a two-player pinball game, with wooden pins representing players. A slight hump in the middle sloped the playing surface, making it easier for the puck (originally a ball bearing) to move to either end of the “ice.” The game evolved, growing from four flippers to five and adding on-ice elements like bluelines and face-off circles. The game was popular with troops during World War II. Munro’s son, Donald Jr., is said to have been called upon to repair games around military installations in Great Britain. Back home, Munro Toys expanded its product line to include games like crokinole, as well as a mechanical baseball game endorsed by Babe Ruth. Present-day competitive table hockey. Photo by Corbin Smith/Torontoist. By the mid-1950s, it was estimated that 75,000 Canadian homes owned a table hockey game. Competition from firms like Eagle Toys spurred refinements, like the replacement of wooden pegs with rods that allowed competitors to spin their players and move them up and down the ice. Deluxe editions added goal lights, period timers, representations of NHL teams, and more realistic boards. In 1968, Munro Toys, by then based in Burlington, was sold to Buffalo-based aerospace firm Servotronics. “They knew a lot about science,” Donald Munro Jr. mused to the Globe and Mail in 1995, “but they didn’t know much about toys or hockey.” In May 1977, after the company defaulted on a loan, Munro Toys went into receivership. 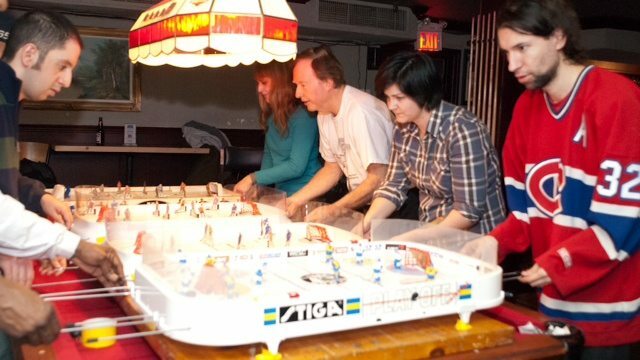 While the popularity of table hockey has dipped since the advent of video games, loyal players continue to conduct home games and participate in local competitions. Additional material from the May 24, 1977 and December 2, 1995 editions of the Globe and Mail.